And remember, these are the official figures. With the poor placement of stations (91 % of the stations are CRN3 to 5 = bad to very poor); where they have purposely taken away the urban heat island effect;, tweak, processes and “adjusted the data; GISS for example uses 1200 km smoothing (which assumes that the weather in London somehow directly affects the weather in Monaco) etc. This year, the May temperature is -4.6 F cooler than 1934, the warmest May. 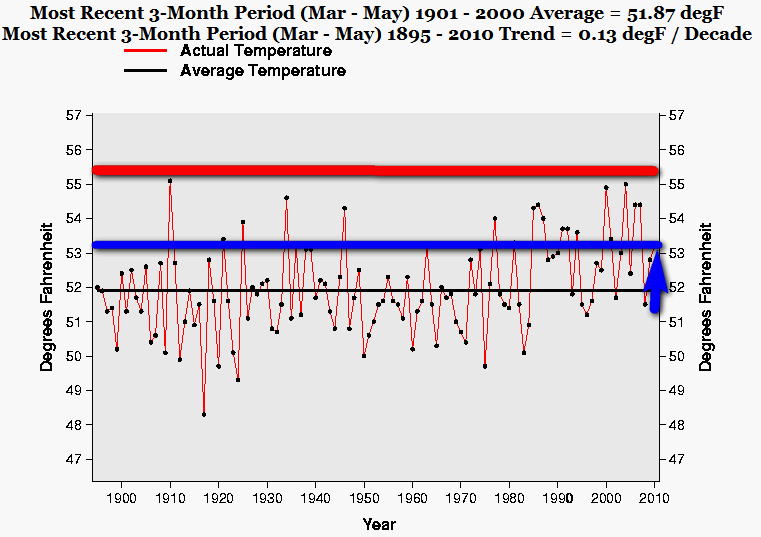 And if we compare this year’s May with 1936, the second warmest May, it is -3.38 F cooler. 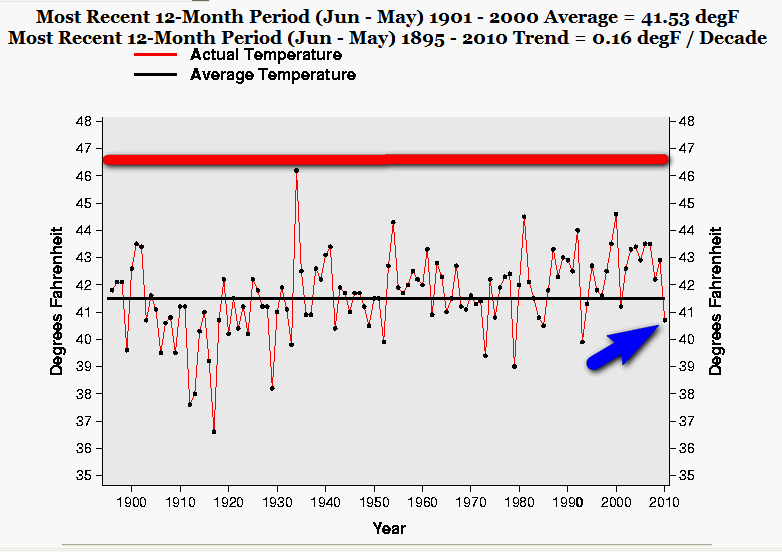 If we compare with 1896 this year’s May is -2.39 F cooler. 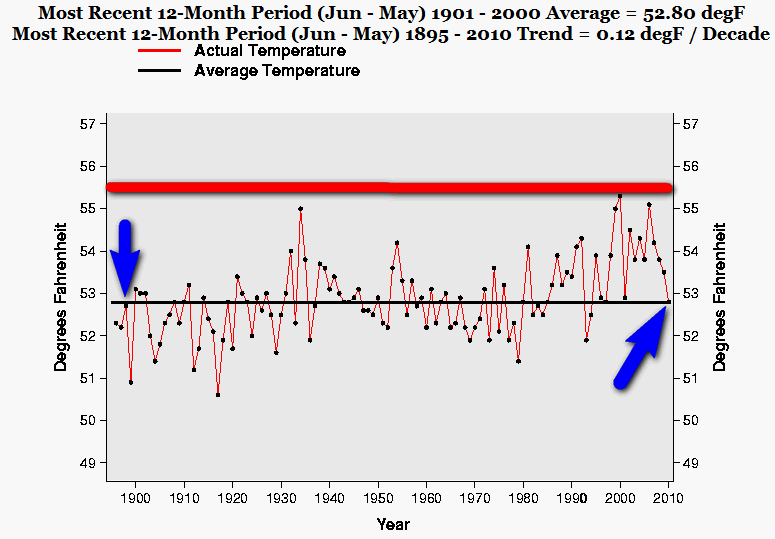 This year, the May temperature is EXACTLY THE SAME AS IN 1895! AND 1904. In fact it is 0.19 F COOLER. One fifth of a degree cooler in 115 years. That’s what I call WARMING! And the recent 3 Month period (Mar-May) 1895-2010. This year, the Mar-May temperature is -1.9 F cooler than for example 1910. And if we compare this years Mar-May temperature with 2004 it is -1.78 F cooler. 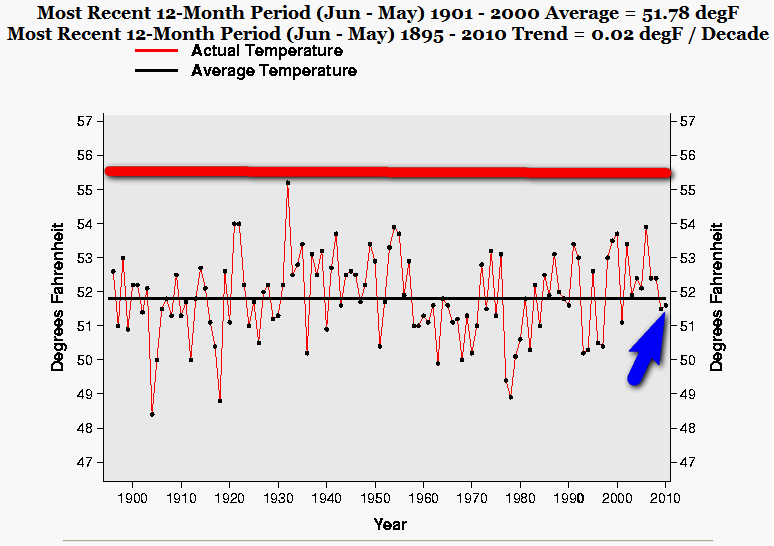 This year, 2010 (Mar-May), the temperature is EXACTLY THE SAME AS IN 1936! In fact it is 0.08 F COOLER. One tenth of a degree cooler in 74 years. 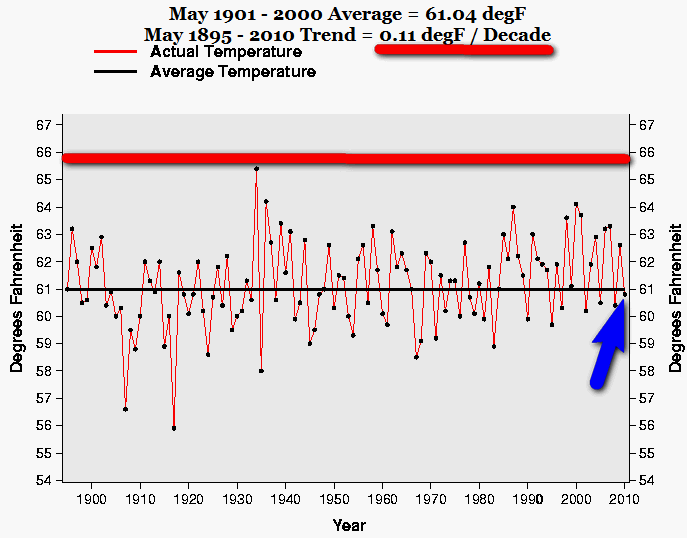 Another glorious example of the catastrophic warming in the last 116 years! This year, the recent 12 Month period temperature is -2.49 F cooler than for example 2000. And if we compare with 1934 it is –2.2 F cooler. 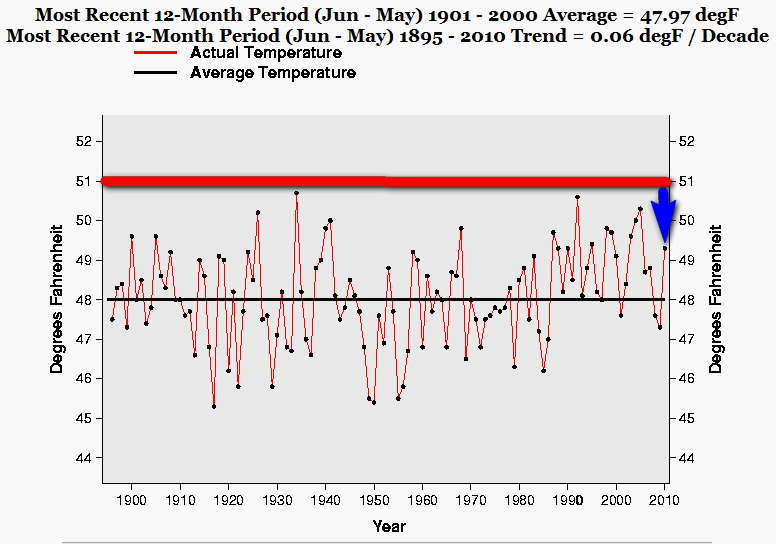 This year, 2009 /2010 (Jun-May), the temperature is EXACTLY THE SAME AS IN 1908! AND 1910. AND 1963. In fact it is 0.02 F Warmer. One fiftieth of a degree warmer in 102 years. Puh, that what I call an imminent treat to humankind! And the recent 12 Month period (May-Apr) 1895-2010 for states. I thought it would be interesting to compare states with the national figures for the recent 12 months. 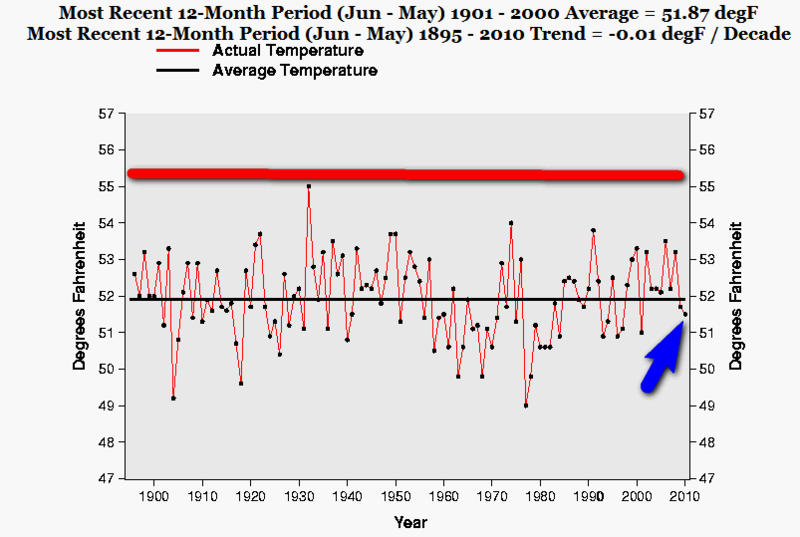 This year, the recent 12 Month period temperature is -4.3 F cooler than for example 1932. And if we compare with 1955 it is –3.7 F cooler. This year, the recent 12 Month period temperature is -2.4 F cooler than for example 1997. And if we compare with 1934 it is –1.9 F cooler. 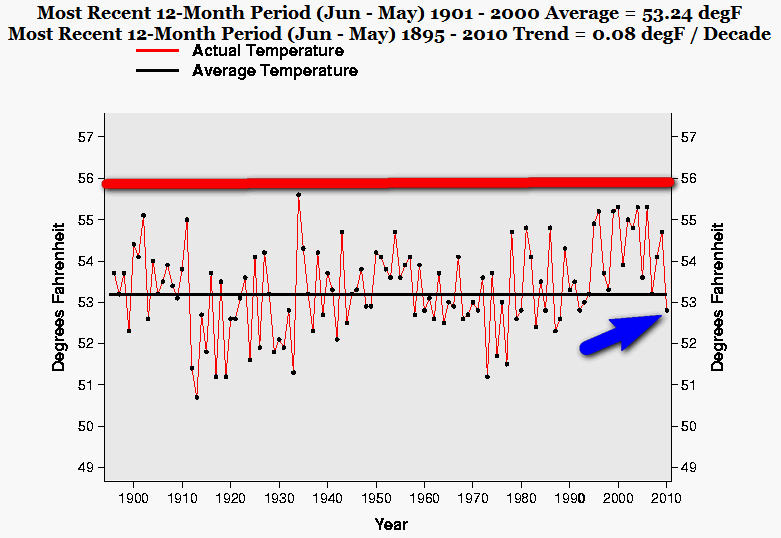 This year, the recent 12 Month period temperature is -4.5 F cooler than for example 1934. And if we compare with 1922 it is –3.6 F cooler. This year, the recent 12 Month period temperature is -3.7 F cooler than for example 1932. And if we compare with 1922 it is –2.5 F cooler. 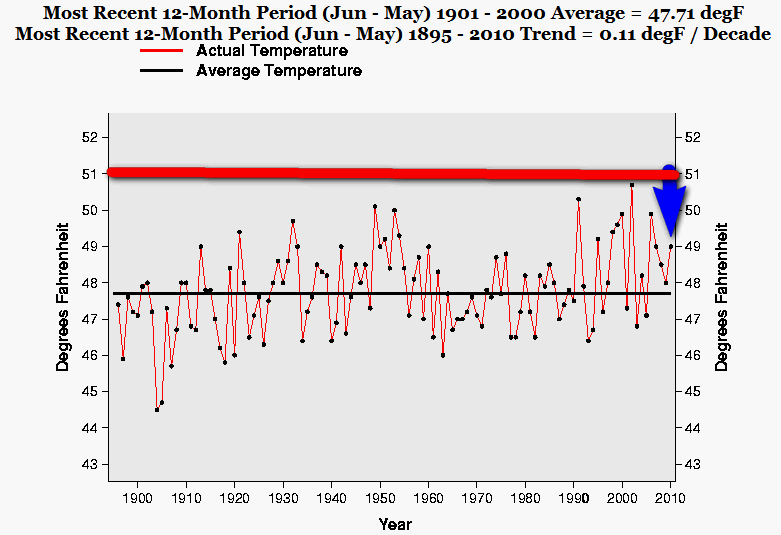 This year, the recent 12 Month period temperature is -4.2 F cooler than for example 1932. And if we compare with 1935 it is –3.6 F cooler. This year, the recent 12 Month period temperature is -1.7 F cooler than for example 2002. And if we compare with 1898 it is –2.2 F cooler. 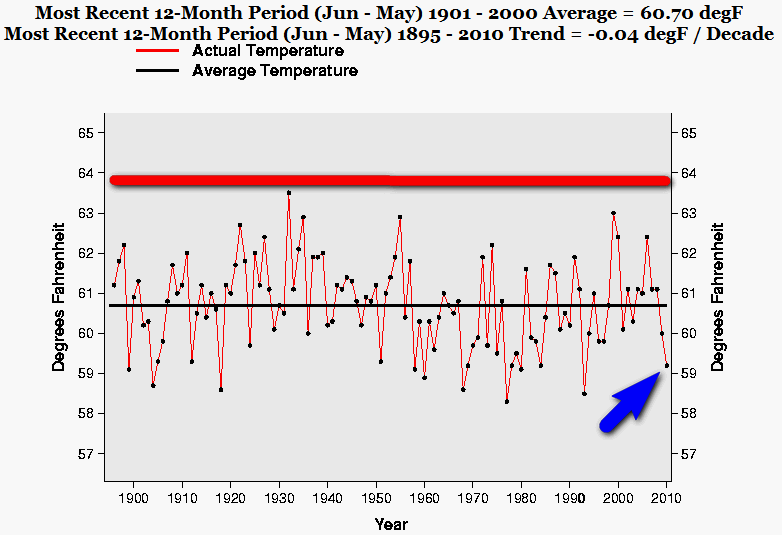 This year, the recent 12 Month period temperature is -2.8 F cooler than for example 1934. And if we compare with 1902 it is –2.3 F cooler. 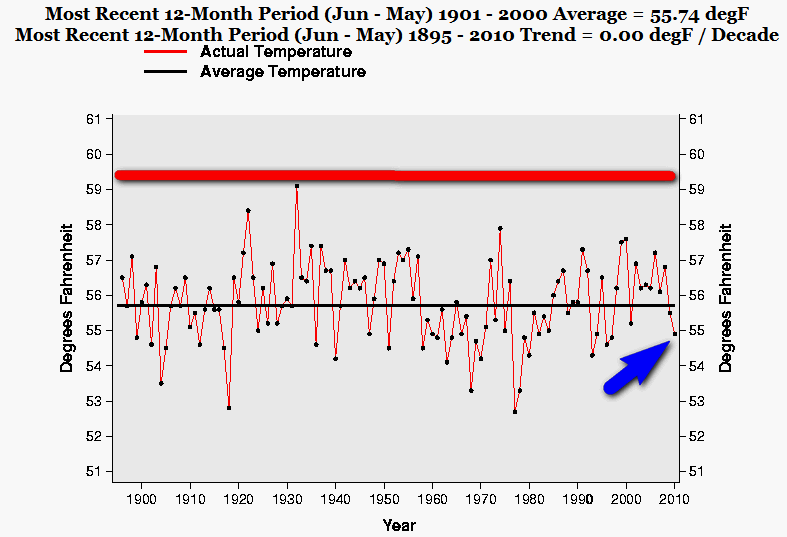 This year, the recent 12 Month period temperature is -1,4 F cooler than for example 1934. And if we compare with 1992 it is –1,3 F cooler. 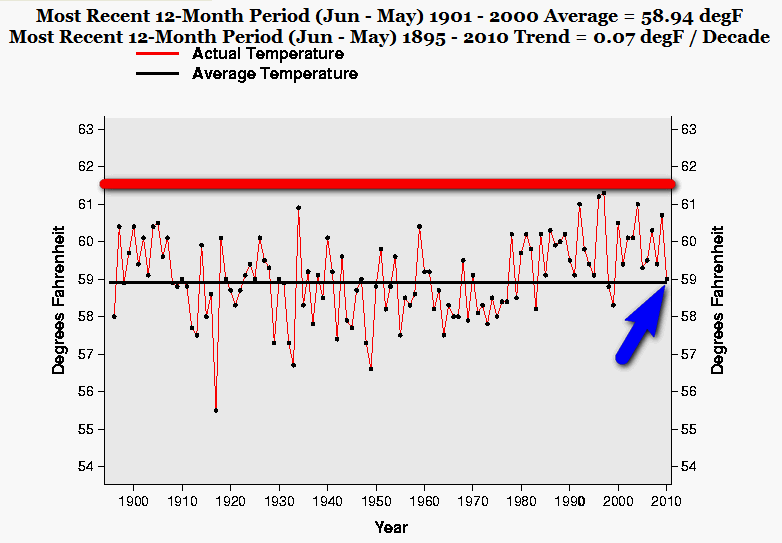 This year, the recent 12 Month period temperature is -3.5 F cooler than for example 1932. And if we compare with 1974 it is –2.5 F cooler. 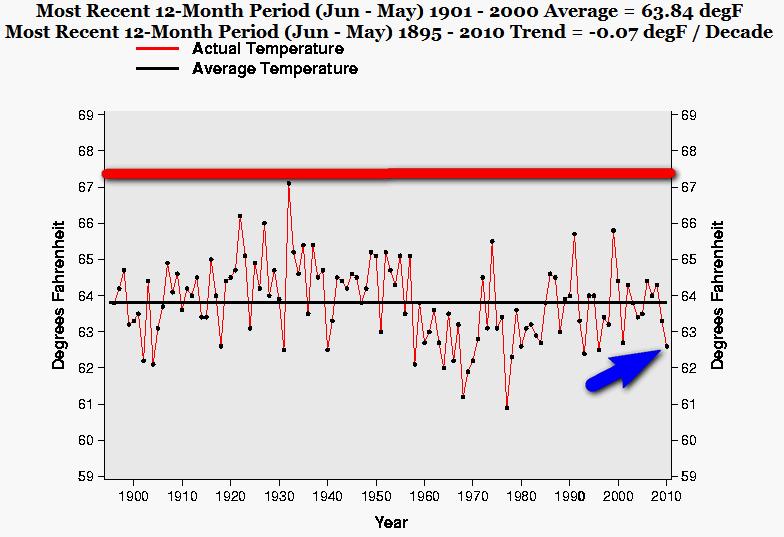 This year, the recent 12 Month period temperature is -5.5 F cooler than for example 1934. And if we compare with 1981 it is –3.8 F cooler. This entry was posted on 13 juni, 2010 at 1:53 e m and is filed under Fri- och rättigheter, Miljö - Environment, USA, Yttrandefrihet. You can follow any responses to this entry through the RSS 2.0 feed. You can leave a response, or trackback from your own site.